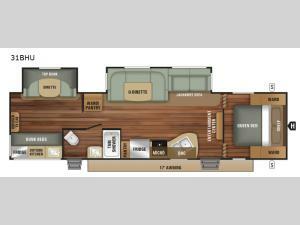 For the ultimate family-friendly travel trailer you will want this double slide out 31BHU Autumn Ridge Outfitter. Your kids will enjoy their own space in the rear bunkhouse. Here there is a set of bunk beds, a dinette, plus a top bunk. Within the roadside slide out in the combined kitchen and living area you will find a u-dinette where you can eat your meals or play a board game or two in the evening. With two entry doors you can easily access the bathroom from outside. When the weather is nice and you prefer to spend more time outdoors then the outside kitchen is sure to be a draw for you! If you are looking for a compact trailer that is easy to tow, then you will want a Starcraft Autumn Ridge Outfitter travel trailer. Each model offers a different set of advantages to help you do camping your way! Along the exterior you will find nitro-filled tires, tinted safety-glass windows, an outside shower, plus exterior speakers. Inside there is a command center with centrally located switches, Sandalwood Maple cabinets, plus stain and soil resistant carpet! You will also find that there are several packages available such as the Customer Convenience Package, the Premium Value Package and the Extreme Package! Come choose your model today!